Bathinda has many holy shrines and each one of them has a unique history associated with it. Damdama Sahib, otherwise known as Talwandi Sabo is a place which holds a very important place for the Sikh community. Every year thousands of Sikhs all over the world come here to visit this religious place that was blessed with various gurus of Sikh community. Every year, grand fairs are held on the occasion of Baisakhi at this place. 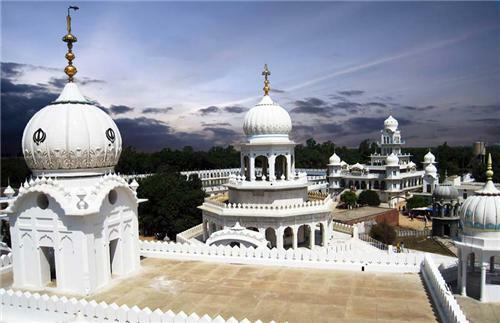 Located about 28 KM in the southeast of Bathinda City, Talwandi Sabo is also known as Damdama Sahib. Damdama Sahib is an important place in the history of Sikhism as writing and compilation of Sikh Scriptures was done here and the work came to be known as the holy book of Sikhs “Guru Granth Sahib”. The place became an important religious shrine as it got blessed with the 10th Sikh Guru, Guru Gobind Singh Ji. The revised and genuine version of Adi Granth Sahib was prepared at Damdama Sahib. Damdama Sahib Talwandi Sabo is the place where Guru Gobind Singh Ji rested for about a year while he was returning back from Battle of Chamkaur. Damdama Sahib has got 10 Gurudwaras and 3 water tanks or sarovars. These sarovars are Gursar Sarovar, Nanksar Sarovar and Akalsar Sarovar. Damdama Sahib has its name derived from the word “Dam”. It is the place where Guru Gobind Singh Ji had arrived when he left Shri Anandpur Sahib Fort after battle of Muktsar. After leaving the fort, he travelled through places like Chamkur Sahib, Deena Kangar, Maachiwara. Talwandi Sabo was an elevated land area and here Guruji had untied his back belt to take rest. In total he stayed here for about 9 months and 9 days. During his stay, he released “Hukamnama” to the Sikhs and declared Talwandi Sabo as a sacred place for the Sikhs. At this place only, the new and revised version of Adi Guru Granth Sahib was prepared and released. To the original version of Adi Granth Sahib prepared by Guru Arjan Dev Ji, Guru Gobind Singh Ji added verses told by Guru Teg Bahadur Hi. Many people of this area became Sikh during his stay at Talwandi Sabo. In the year 1999 in April Month, Damdama Sahib got declared as the 5th Sikh Takht by the Indian Government. The year was important as it was the tri-centennial celebration of Khalsa Formation. The takhat of Damdama Sahib is about 2 m high and it is made with white marble. The takhat is place in the southern part of the hall. The takhat is the place where Guruji used to sit. The hall is beautifully built with high ceilings. The inner hall has many types of designs and colors. There is a square dome above the sanctum. There are octagonal towers at the corner of the hall. 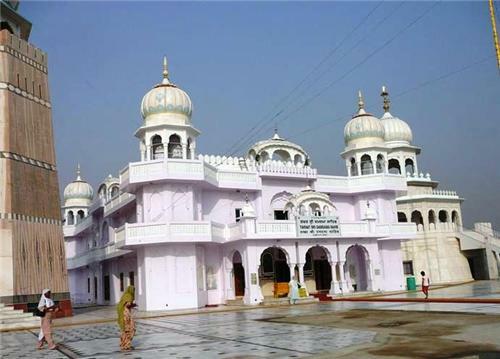 Damdama Sahib Talwandi Sabo is also called as “Guru Ki Kashi “. In the year 1706, in the month of January, Guru Gobind Singh Ji had come to Talwandi Sabo and stayed here. The Gurudwara Shri Damdama Sahib witnessed his stay at this place. Guruji was given respect and taken care of very well by the local Chaudhury name Bhai Dalla. He did not arrest Guru Gobind Singh Ji though he was instructed to do so by the Nawab of Sirhind, Wazir Khan. While the final form of Guru Granth Sahibji was getting done by Guru Gobind Singh Ji, many wooden pens were distributed by him to the devotees. He blessed the place stating that it would become an important seat of learning and divine knowledge. He explained the meaning of Gurubani to the Sikhs. Before Guru Gobind Singh Ji headed toward Nanded, he handed over the responsibility of the Takhat Damdama Sahib to Baba Deep Singh Ji. Damdama Sahib has gurudwaras dedicated to various Sikh Gurus. Here is the information about the Gurudwaras of Damdama Sahib. When Guru Gobind Singh Ji entered Talwandi Village he had come to this gurudwara and that is why it is named as Gurudwara Shri Damdama Sahib. 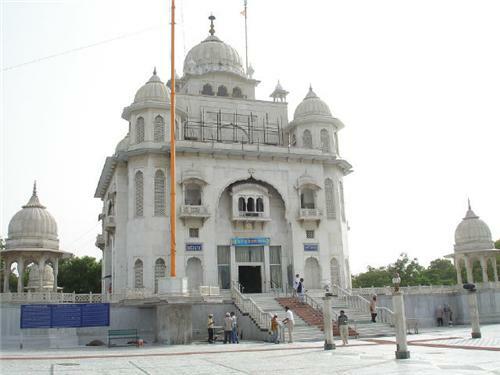 This gurudwara is located in the north part of Damdama Sahib at a corner of the water body name “Guru Sar”. This gurudwara is blessed by Guru Teg Bahadur Ji. It is said that Guruji used his shawl so that he could carry cement to be used for construction of the pool, “Guru Sar”. This gurudwara was constructed to commemorate the occasion of Guruji testing his gun. Maha Singh from Lahore had presented the gun to the Guruji. This gurudwara is located in between the Gurudwara Shri Damdama Sahib and Takht Sri Damdama Sahib Gurudwara Likhansar Sahib- this place is located on the right hand side of the road that comes out from Shri Damdama Sahib. At this place, Guru Gobind Singh Ji had dictated the verses of revised Adi Guru Granth Sahib. He had dictated the verses to Bhai Mani Singh Ji. Once the revised form of Adi Guru Granth Sahib got completed, it became the holy book of Sikhs all over the world and is known as “Guru Granth Sahibji”. It is located at the back end of Damdama Sahib. This is the place where Mata Sunder Kaurji, Mata Sahib Kaurji amd Bhai Mani Singhji stayed. It is located in the northeastern part of Damdama Sahib and is about half mile away from Damdama Sahib. At this place, the hidden treasure was uncovered by Guru Gobind Singhji and he distributed the treasure among his soldiers. The horse of Guruji was tied to the Jand and that is why the pool became famous as Jandsar. It is located about 1 km away from Takhat of Damdama Sahib. This place is famous as “Hola Mohalla” was played here by Guru Gobind Singh Ji. Hola Mohalla means martial arts and other games and sports and every year Hola Mohalla starts at Takhat Damadama Sahib on the day following Baisakhi and the event ends at Gurudwara Mehalsar Sahib. Some other items like clothes of Mata Sahib Kaurji, 2 turbans, 1 pyjama and 1 chola are also exhibited upon request by the present ancestors of S. Shamsher Singh at their residence. The items are on exhibit from 7 AM - 5 PM.